To say the least, it has been a trying time for Boeing officials with the recent accidents involving the 737 Max 8 commercial aircraft. But the company was able to announce a bit of good news. 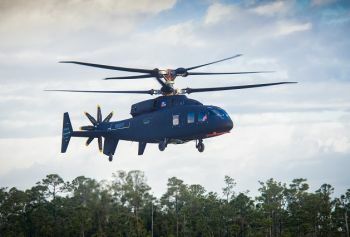 The Sikorsky-Boeing SB>1 DEFIANT™ helicopter achieved first flight March 21st at Sikorsky's West Palm Beach, Fla., site. 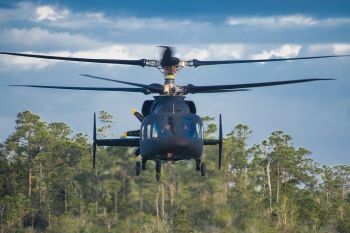 This revolutionary aircraft, developed by Sikorsky, a Lockheed Martin Company, and Boeing, will help inform the next generation of military helicopters as part of the U.S. Army's Future Vertical Lift program. "The design and development of DEFIANT has revealed the capability advancement that is truly possible for Future Vertical Lift," said David Koopersmith, vice president and general manager, Boeing Vertical Lift. "Clearly, the performance, speed and agility of DEFIANT will be a game changer on the battlefield and we look forward to demonstrating for the U.S. Army the tremendous capabilities of this aircraft." With its two coaxial main rotors and a rear mounted pusher propulsor, DEFIANT is unlike production rotorcraft available today. It represents a leap forward in technology to achieve the U.S. government's desire for vast increases in speed and range while improving maneuverability and survivability in a cost-effective way. DEFIANT aircraft's use of X2™ Technology will allow the Army to penetrate from strategic standoff and exploit gaps created in complex Anti-Access Area Denial systems against near-peer adversaries. "DEFIANT is designed to fly at nearly twice the speed and has twice the range of conventional helicopters while retaining the very best, if not better, low-speed and hover performance of conventional helicopters," said Dan Spoor, vice president, Sikorsky Future Vertical Lift. "This design provides for exceptional performance in the objective area, where potential enemy activity places a premium on maneuverability, survivability and flexibility. We are thrilled with the results of today's flight and look forward to an exciting flight test program."